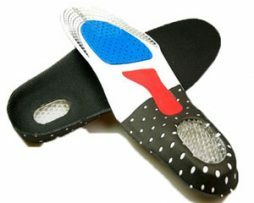 These sports and running insoles are designed for professional and amateur athletes and those involved in vigorous physical activity that involves a lot of twisting and turning and running that can cause injury (everything from warehouse work to a hard game of football), they are used for preventing and treating injuries through a rigid shock-absorbing design. If you suffer from either shin splints, medial tibial stress syndrome, tibial stress fracture, bone stress reaction, jumper’s knee. 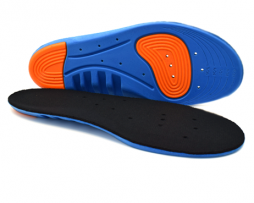 ilio tibial band friction syndrome or osteoarthritis, these insoles can help you in treating your injury. If you don’t suffer from any of these conditions the sports & running insoles can help to prevent them from occurring in the first place. 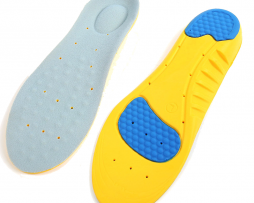 We have two main types of insoles to choose from, the premium running insoles and the general sports insole. 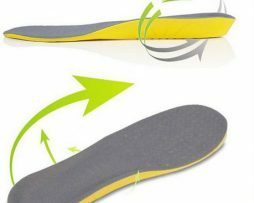 Both of our sports and running insoles come with heel support which helps to spread pressure that may start accumulating at the bottom of your heel evenly and safely throughout your foot so it is not focused on the heel which may cause damage. The premium running insole benefits from maximum shock-absorbing design and is excellent for high impact activity on hard surfaces such as running or even football. If you regularly pound the pavement whilst running on the roads the impact can cause a shock wave of pressure up through your joints and this wave of pressure over time can cause joint and ligament damage and lead to straining injuries. Maximum shock absorption reduces these forces down to the minimum so you can avoid injury. The general sports insole has a thinner shock-absorbing design but benefits more from the additional arch support. If you suffer from flat feet or overpronation of the feet whilst running you will benefit more from an arch support insole. Your weight can put a lot of pressure on your feet and in sport we tend to run around and jump which may amplify this pressure and just like a ‘bridge’ there is only so much pressure your arches can take until they succumb to the pressure and cause injuries such as plantar fasciitis (painful inflammation around the heel of the foot). Arch supports help to make sure your feet are supported and take some of the strain away from your arches making sure it doesn’t become injured. This insole is built to be more rigid than other Nuova Health arch supports to offer better shock absorption for sports. The general sports insole also has a built-in metatarsal support. All our products come with the usual money back guarantee as we are so confident that our product will help you.